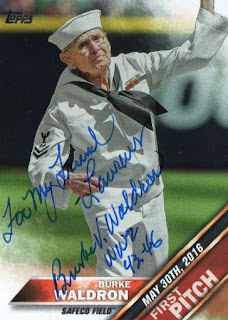 The 93-year old WWII veteran who threw out the first pitch before a Seattle Mariners game in 2016 signed my two cards in blue ink [one personalized] in about a couple of weeks - Waldron also sent a two-page note and sent a small info card for the Latter-day Saints, with the inscription 'And I'm a 'Mormon' written. 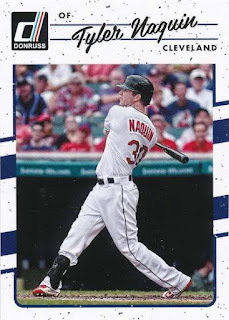 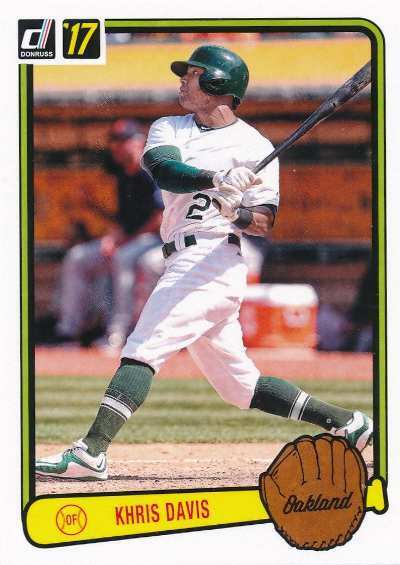 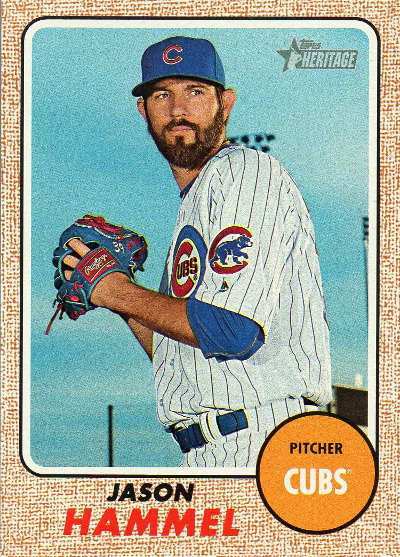 Maybe it's the least that can be done for someone who served his country and who has lived as long as he has - but it's nice for Waldron to get his 15-minutes of fame and be immortalized on a baseball card insert of his own. I made it a point to send to an autograph request to Waldron with two First Pitch insert I found - after it became a thing where TTM collectors reported successes from him. 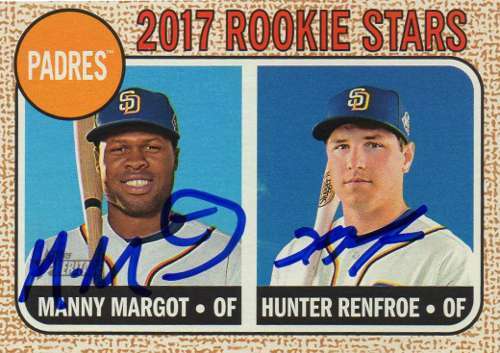 I wanted to see how a dual player 2017 Topps Heritage Rookie Stars subset card would look autographed - it's not really a thing where I always seek multiplayer cards out to be inked up because I worry about completion, but I got Margot first [sacrificing my chance to get a set card signed, since he signs one per person], then managed to finish the card up by getting Renfroe. With a donation, I was able to get the Hall of Famer's autograph on a couple of his cards - I saw that he started signing TTM again and wanted to see if I could get a response. 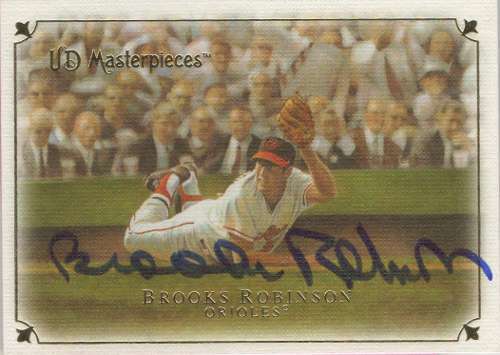 I remember 15-20 years ago when Robinson would sign through the mail for a small fee - I also remember when he basically stopped answering TTM requests because he had some sort of agreement with a card shop for paid signings. Robinson's autograph may not pop as much with the matte card surface and the darker, painted image used on the 2007 Upper Deck Masterpieces card - but the auto is nearly centered perfectly to go with the horizontal picture. 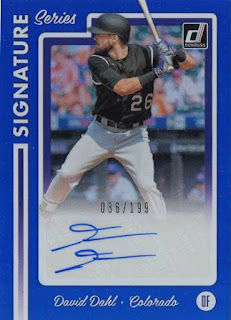 I've wanted an autograph of the Colorado Rockies outfielder for at least the past few years but I've never gotten to see him in-person - I ended up picking up a 2017 Donruss certified autograph for $5 and change and while it's not like actually getting Dahl to sign something in-person, it's good enough just to say I have his scribble in my collection. 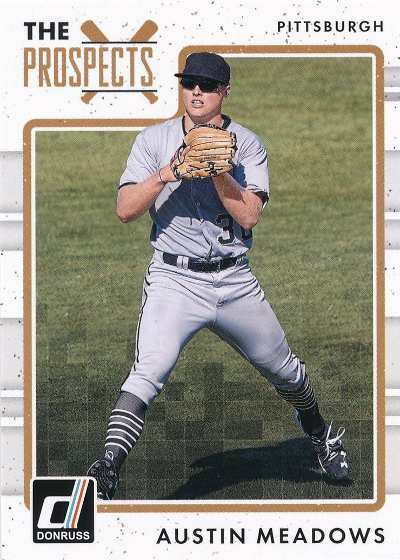 Despite being a blue chip prospect who had a fine MLB debut season in 2016 - Dahl has had to deal with some physical ailments, so who knows if he ends up being sort of fragile otherwise, where his ascent as a big league star maybe slowed down a bit. Dahl had his spleen removed after an outfield collision in 2015 and while he seemed to get over that over the next year - he has been shut down for much of spring training after a stress reaction in his ribcage and isn't likely to start the year on the Rockies' Opening Day roster. 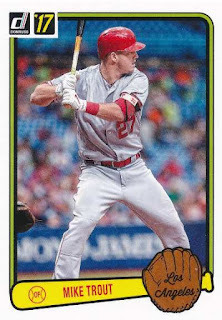 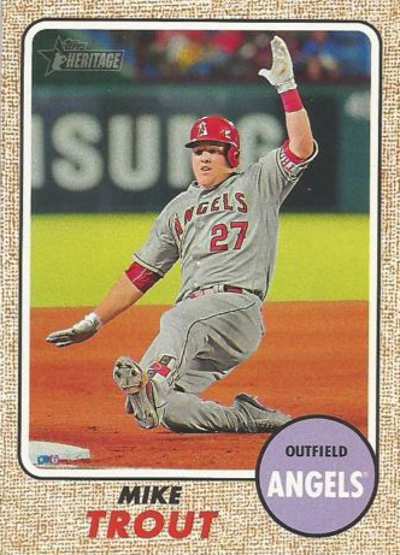 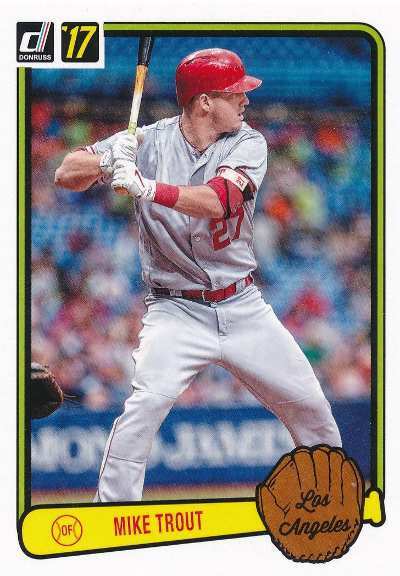 I picked up this Action variation parallel for my Trout PC - because he's gotten to be so prominent with his premium cards going for big money, I’m merely collecting Trout’s cards ‘as is’ as opposed to really caring about whether I pick up any specific card. 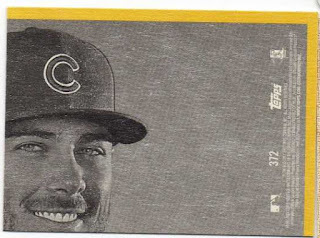 I'll keep any miscellaneous cards I'll pull or find and when the mood strikes - look for at least one nice looking, current year non-auto insert / parallel that isn’t going to cost an arm and a leg. 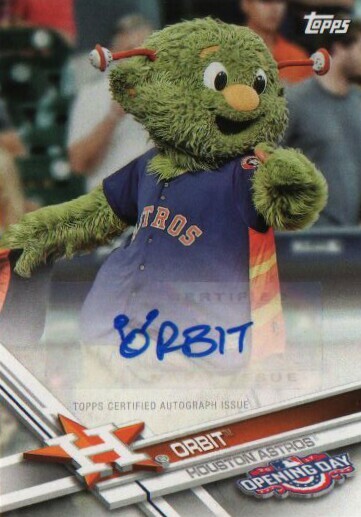 It looks like a fresh box was open on the counter and while I really turn my nose at this more cutesy, 'flagship-lite' alternative - I wanted to bust some packs and for a dollar each, was there anything to lose? 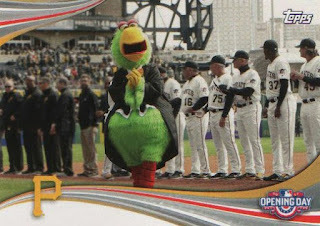 #MA-O Orbit - Mascot Autographs; it’s a friggin autograph of a mascot but I’ll comfort myself in seeing it’s supposedly seeded at a rate of 1:747 packs. I purchased a blaster box the day I picked up my random card shop packs a few weeks ago - I remember listing out what I pulled from my hobby pack breaks first, then feeling like maybe I should go on with the blaster box. 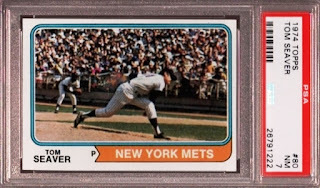 It looks like there were actually nine packs [instead of eight totals packs] in my blaster for a total of 81 cards - I didn't pull a Target exclusive 1968 game rookie insert, so I think I might have been somehow skunked with this retail box, but ended up pulling six short prints [usually pulled 1:3 odds]. 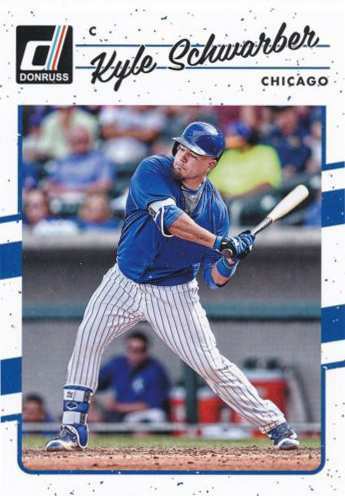 With a look inspired by an updated take on 1990 Donruss, the base cards are sharp, though still otherwise feel generic - maybe my small sample size of two packs doesn't quite tell the entire story, but it's hard to buy into these cards when they don't really stand out. 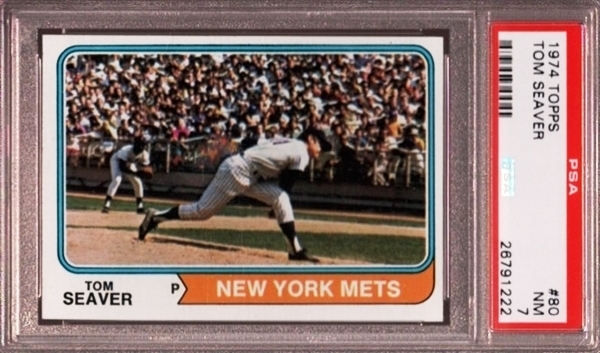 I picked this card up for a sampler run of PSA graded Topps cards from 1952-1980 - I've always associated old-school [anything between 1974-1985] or vintage [1973 and older] cards as something 'old and valuable,' especially when the cards came out before I was alive. 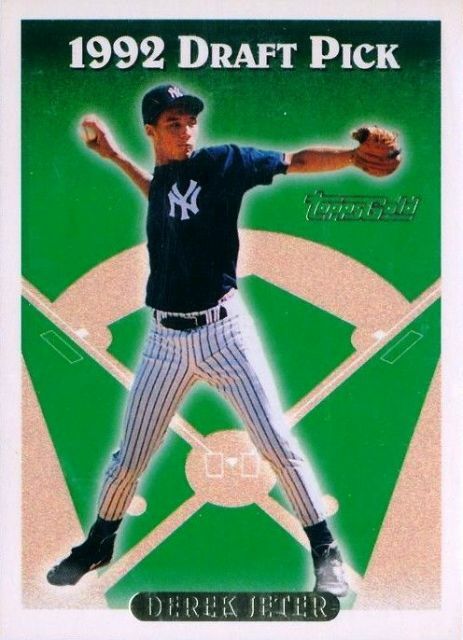 I kind of want to see if this particular project becomes a more significant, satisfying chase - while eBay effectively saturated the market, it makes it easier to look for cards whose values were inflated 25-30 years ago, even if they weren't quite the big money old-school/vintage cards serious collectors continue to chase today. 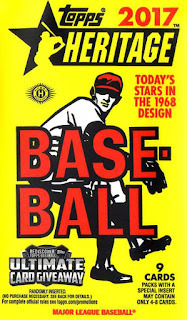 So far I only have 3 of 28 cards [a 1960 Willie Mays and a 1961 Eddie Mathews are the other two I bought years ago] for this project - there maybe a couple of other cards I can use, though they maybe tied to another part of my collection, so I might only decide to use them if they are the final two cards I need. 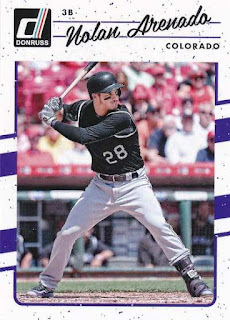 In addition to the Bowman rookie card I picked up a few weeks ago, I also grabbed this rookie-year parallel card - maybe I find myself a priced out of the modern card collecting game [with the focus on guys like Mike Trout and Kris Bryant], so maybe I'm 'going back' to looking for cards I've overlooked over the past 25 years. The 1993 Topps Jeter rookie card is kind of boring with an image of a young Jeter superimposed into a generic outline of a baseball field - the card is sort of a post junk wax era 'junk wax card,' but the foil stamping makes the card looks just a little bit more attractive. 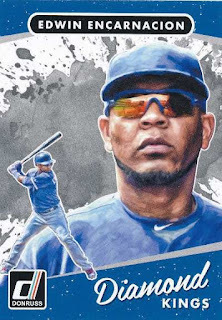 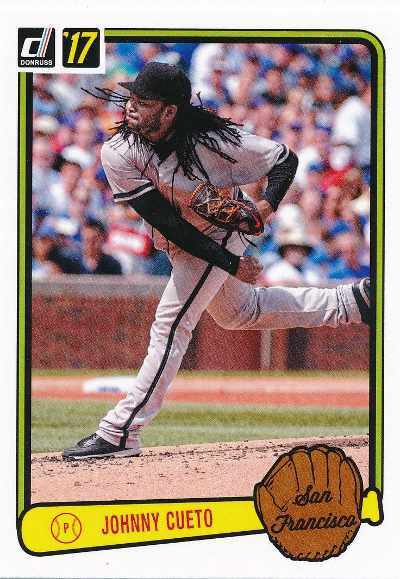 I'm not exactly a fan of Topps Heritage because it has been played out card product to me - I feel like there should be more effort to come up with something original when it comes to baseball cards as opposed to dipping into your 'heritage' as sort of a crutch to stand on. 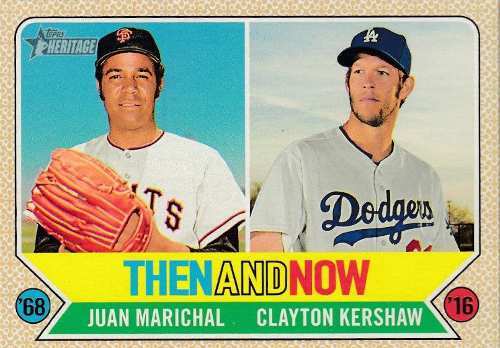 I do appreciate some 'old school' elements in baseball cards, so it's not like I don't get what these cards are about - I grabbed 7 random packs from a card shop and also a blaster box from a Target to see if I can get into these new cards for a little bit. 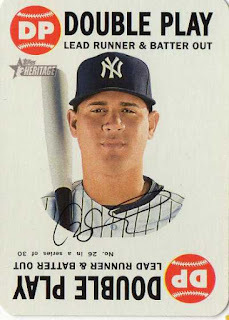 It may not feel authentic, but the thinner card stock is cleaner and the cards look fairly sharp - it seems like there was no effort to make the cards look like the originals, which may not be something people who collect Heritage seriously may like. 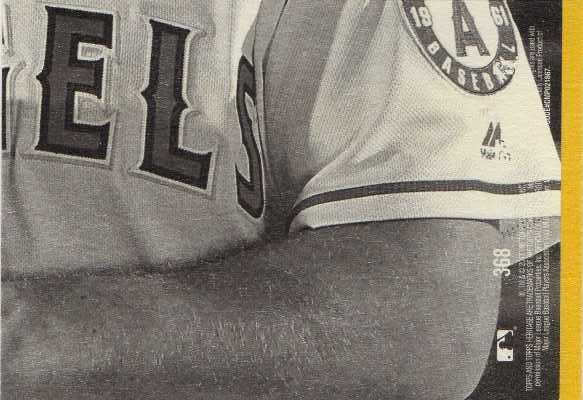 I read a little primer on the original 1968 Topps cards - but despite the inconsistent pattern scheme on the borders, I'm okay with the cards looking a little bland and maybe lacking a little imagination [just considering the cards themselves and not the wrinkles and gimmicks that come with a 2017 release]. The card backs are bright and bold - so that makes them easy to read. 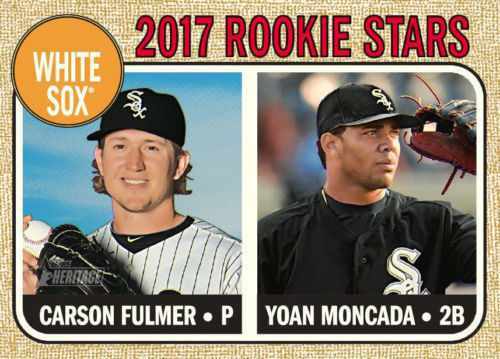 I realize 1968 Topps wasn't a set that used facsimile autographs of the players as part of the design - so the fronts of these 2017 Topps Heritage cards look less cluttered. 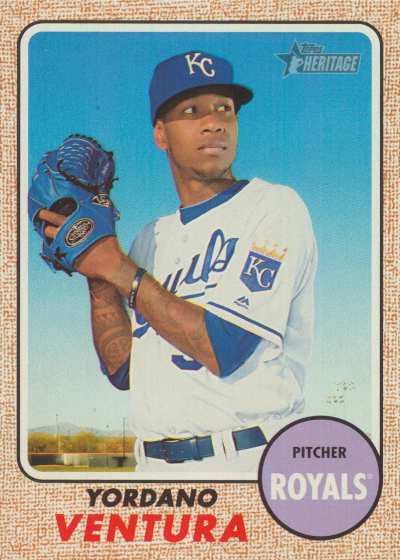 #307 Yordano Ventura - R.I.P. #412 David Ortiz - SP/Color Swap variation? #368 Manny Machado - All-Topps subset; it's totally not obvious who is partially pictured on the back of Machado's card. #149 1987 Topps Ray Searage - Rediscover Topps; damn, this is just what I wanted from a pack of 2017 Topps Heritage. 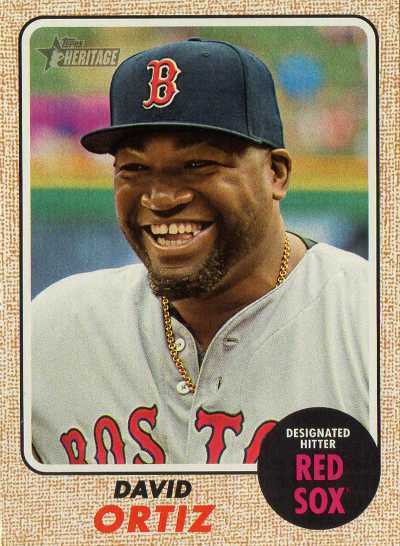 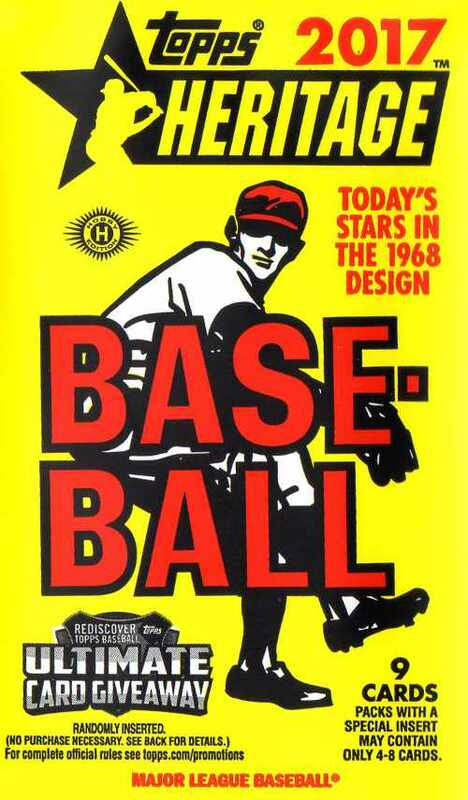 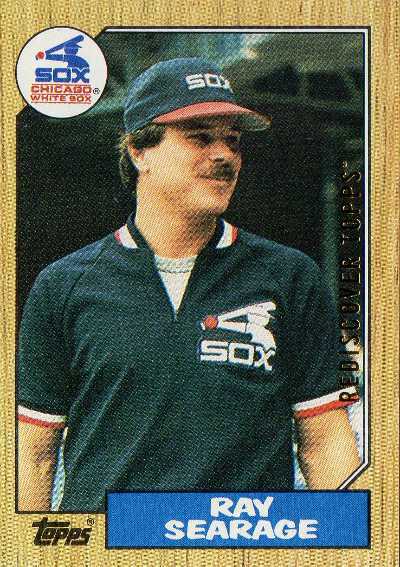 It's going to be another 19 years for 2036 Topps Heritage to come out featuring 'Today's Stars in The 1987 Design' - where pulling a buyback card from 1987 Topps would make sense, though I probably could have pulled any junk wax era card from this latest Topps promotion. #372 Anthony Rizzo - All-Topps subset; it's totally not obvious who the smiling mug on the back of Rizzo's card belongs to.